Be ready for action packed days of canoeing, rock climbing, mountain biking, fishing, geocaching, zip lining, low ropes courses, archery, and more! 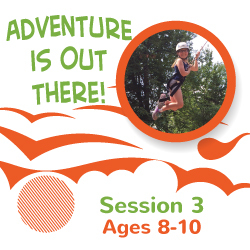 Each day will bring a new adventure that is perfect for active adventure loving kids! Often the adventure for the day will involve heading offsite to explore or learn a new skill at a different park or facility. This camp is staffed by experienced outdoor educators ready to bring the best possible experience to the participants. Bring a lunch and wear comfortable clothing with closed toed shoes. Snack is provided. On and off-site. Please note: All eight sessions of Adventure is Out There! camp have the same content, the only difference being the ages allowed in each session and the dates they are offered. If a session you are interested in is full, you may also want to check other sessions for availability. Cost: $275 ($250 for River Bend members).